Don’t let the long recipe name fool you; this walleye dish is easy to make and will add a different spin to your catch. You can use any white fish for this recipe, but I chose walleye because it is so mild that it will easily take on whatever flavors you apply to it. The brand of curry I used may be difficult to find. If so, I recommend the brand Mae Ploy, which makes very nice curries that are simple to use. 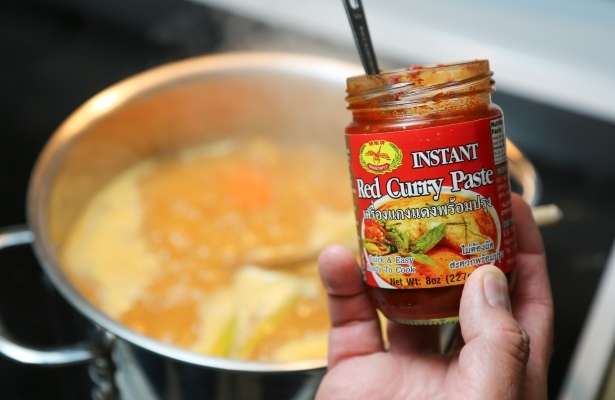 Other curries – instant or not – will work fine, but be sure to read the directions on the packaging and add it to your stew accordingly. Also, use whatever vegetables and starches you have on hand. 1. Peel dry outer layers of lemongrass stalk and wash if necessary. 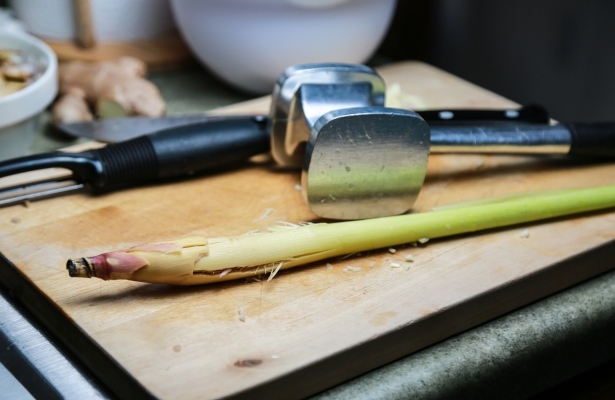 Using a meat tenderizer or rolling pin, pound the lemongrass stalk to soften it and release its juices. Set aside. 2. Heat 1 tablespoon of oil in a large pot over medium heat. Add minced shallot and sliced ginger and sauté for 60 seconds until fragrant. Add garlic and sauté for 30 seconds, but do not brown. 3. 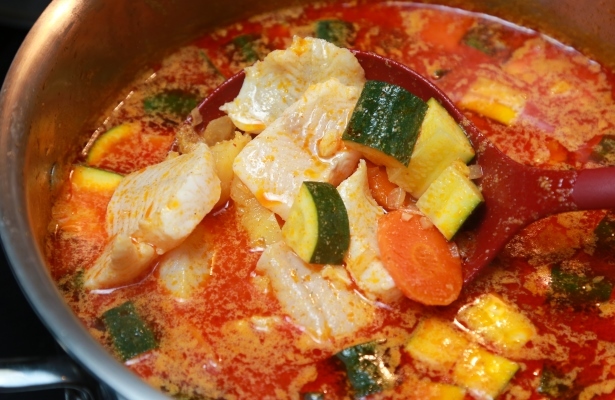 Add carrot, potatoes, smashed lemongrass (fold over to fit into pot), seafood stock and water. Bring to a boil and then back down to a simmer. 4. Next, add Thai red curry paste, coconut milk and tamarind paste. However, do not add all at once. Not all pastes are made the same, depending on the brand you buy—some are spicier, saltier or more sour – season according to your taste. 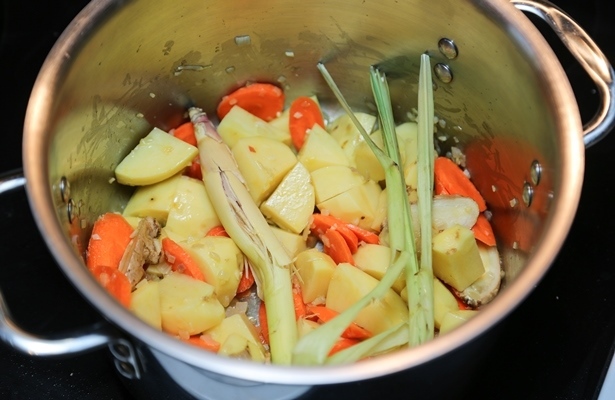 Cover the pot and simmer for 20-30 minutes or until potatoes and carrots are tender. 5. Add the zucchini toward the end, as it will cook quickly. 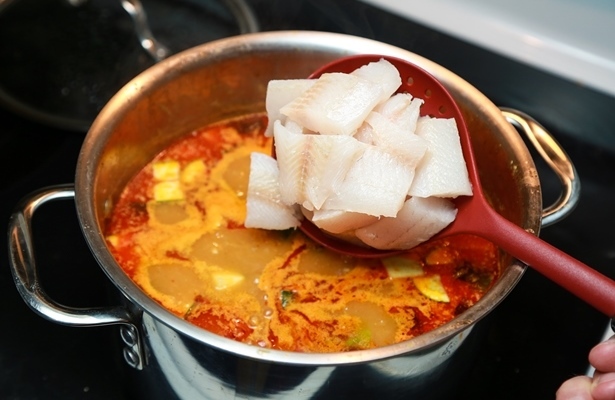 Before serving, gently lay walleye chunks into the simmering (not boiling) broth and cook for 5 minutes or until tender and flaky. Taste for seasoning. 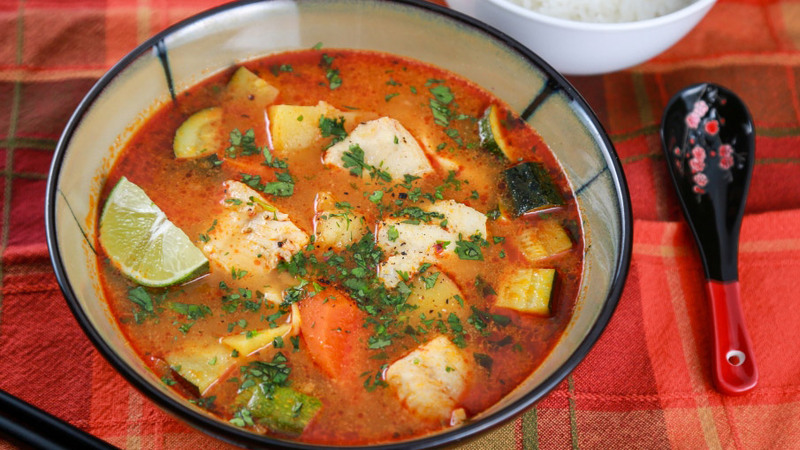 Ladle stew into bowls and garnish with cilantro. Serve with white rice if desired.